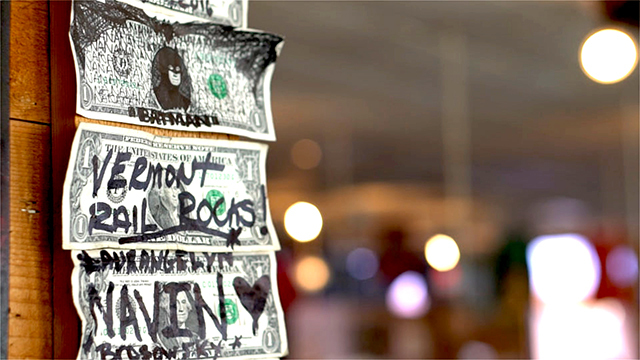 What Happens to the Dollar Bills on This Restaurant’s Walls? When you walk into PJ’s Oyster Bar on St. Pete Beach, Florida, you’re greeted by the mascot, PJ — a live parrot in a cage. Then you see the thousands of dollar bills plastered on every wall, covered in signatures and doodles. And every one of them has a story. Restaurant patrons post $1 bills to celebrate birthdays, anniversaries, family trees and first dates. Celebrities know the drill, too. Former Chicago Bears offensive lineman Tom Andrews signed a dollar in 1985. It’s still there, next to his picture. Singer John Prine left a bill for his fans. Even Batman has left his mark. Every so often, when the walls are full, staff take down the bills. And that’s where things get interesting. Where Do All Those Dollar Bills Go? Over the years PJ’s has collected more than $10,000 from its walls, according to McGahan. The bills may be covered in permanent marker, but the money is still good! The restaurant donates every dollar to the Ronald McDonald House of Tampa Bay. The nonprofit’s four houses offer a home away from home for families whose children are receiving life-saving medical care in Tampa Bay area hospitals. The donations have covered the cost of at least 125 nights’ stays, so parents can focus on their children’s recovery rather than on finding and paying for a hotel room. “We are totally dependent on our community, because we do not get any government funding,” explains Joo Hooi Albritton, manager of the Ronald McDonald House. Fortunately, the donations will continue as long as the tradition does at PJ’s. Your Turn: How are you celebrating National Dollar Day? Christie Post, social media video producer at The Penny Hoarder, is always finding ways to make stories visual. You can see her live broadcasts on our Facebook page. Give her a shoutout on Twitter @christiepost.